From trying to find the edge on a roll, to opening a tightly sealed box, packing tape simply isn't designed to be used by those lacking long fingernails. But this cleverly designed Box Tape levels the playing field with one edge that lacks adhesive so that it's easy to pull up and completely remove. There are some downsides to the design, though, most notably that you can't actually buy it yet because the Box Tape is still just a concept. 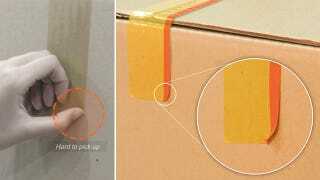 But also that unstuck edge could get peeled up as a package bounces around in transport, increasing the risk of the tape accidentally getting pulled off and unsealing a box.